Vitamin B6 refers to a group of chemically very similar compounds which can be interconverted in biological systems. Vitamin B6 is part of the vitamin B complex group, and its active form, Pyridoxal 5'-phosphate (PLP) serves as a cofactor in many enzyme reactions in amino acid, glucose, and lipid metabolism. All forms except PA cannot be interconverted. Absorbed pyridoxamine is converted to PMP by pyridoxal kinase, which is further converted to PLP by pyridoxamine-phosphate transaminase or pyridoxine 5’-phosphate oxidase which also catalyzes the conversion of PNP to PLP. Pyridoxine 5’-phosphate oxidase is dependent on flavin mononucleotide (FMN) as a cofactor which is produced from riboflavin (vitamin B2) i.e. in this biochemical pathway, dietary vitamin B6 cannot be used without vitamin B2. Transaminases break down amino acids with PLP as a cofactor. The proper activity of these enzymes is crucial for the process of moving amine groups from one amino acid to another. Serine racemase which synthesizes the neuromodulator serine is a PLP-dependent enzyme. PLP is a coenzyme needed for the proper function of the enzymes cystathionine synthase and cystathionase. These enzymes work to transform methionine into cysteine. Selenomethionine is the primary dietary form of selenium. PLP is needed as a cofactor for the enzymes that allow selenium to be used from the dietary form. PLP also plays a cofactor role in releasing selenium from selenohomocysteine to produce hydrogen selenide, which can then be used to incorporate selenium into selenoproteins. PLP is required for the conversion of tryptophan to niacin, so low vitamin B6 status impairs this conversion. PLP is a required coenzyme of glycogen phosphorylase, the enzyme necessary for glycogenolysis to occur. PLP can catalyze transamination reactions that are essential for providing amino acids as a substrate for gluconeogenesis. PLP is an essential component of enzymes that facilitate the biosynthesis of sphingolipids. Particularly, the synthesis of ceramide requires PLP. In this reaction, serine is decarboxylated and combined with palmitoyl-CoA to form sphinganine, which is combined with a fatty acyl-CoA to form dihydroceramide. Dihydroceramide is then further desaturated to form ceramide. In addition, the breakdown of sphingolipids is also dependent on vitamin B6 because S1P lyase, the enzyme responsible for breaking down sphingosine-1-phosphate, is also PLP-dependent. PLP aids in the synthesis of hemoglobin, by serving as a coenzyme for the enzyme ALA synthase. It also binds to two sites on hemoglobin to enhance the oxygen binding of hemoglobin. PLP has been implicated in increasing or decreasing the expression of certain genes. Increased intracellular levels of the vitamin lead to a decrease in the transcription of glucocorticoids. Also, vitamin B6 deficiency leads to the increased gene expression of albumin mRNA. Also, PLP influences expression of glycoprotein IIb by interacting with various transcription factors. The result is inhibition of platelet aggregation. Vitamin B6 is widely distributed in foods in both its free and bound forms. Good sources include meats, whole-grain products (including cereals), vegetables, nuts, and bananas. Cooking, storage, and processing losses of vitamin B6 vary and in some foods may be more than 50%, depending on the form of vitamin present in the food. Plant foods lose the least during processing, as they contain mostly pyridoxine, which is far more stable than the pyridoxal or pyridoxamine found in animal foods. For example, milk can lose 30 to 70% of its vitamin B6 content when dried. Vitamin B6 is found in the germ and aleurone layer of grains, and milling results in the reduction of this vitamin in white flour. Freezing and canning are other food processing methods that result in the loss of vitamin B6 in foods. The best natural sources include avocado, brewer's yeast, wheat bran, wheat germ, liver, kidney, heart, blackstrap molasses, milk, eggs, and beef. The Recommended Daily Allowance of the Institute of Medicine is 1,3 mg/d for a 19- to 50-year-old adult. Vitamin B6 is absorbed in the jejunum and ileum by passive diffusion. With the capacity for absorption being so great, animals are able to absorb quantities much greater than necessary for physiological demands. The absorption of pyridoxal phosphate and pyridoxamine phosphate involves their dephosphorylation catalyzed by a membrane-bound alkaline phosphatase. Those products and nonphosphorylated forms in the digestive tract are absorbed by diffusion, which is driven by trapping of the vitamin as 5'-phosphates through the action of phosphorylation (by a pyridoxal kinase) in the jejunal mucosa. The trapped pyridoxine and pyridoxamine are oxidized to pyridoxal phosphate in the tissue. The products of vitamin B6 metabolism are excreted in the urine, the major product of which is 4-pyridoxic acid. An estimated 40–60% of ingested vitamin B6 is oxidized to 4-pyridoxic acid. Several studies have shown that 4-pyridoxic acid is undetectable in the urine of vitamin B6-deficient subjects, making it a useful clinical marker to assess the vitamin B6 status of an individual. Other products of vitamin B6 metabolism excreted in the urine when high doses of the vitamin have been given include pyridoxal, pyridoxamine, and pyridoxine and their phosphates. A small amount of vitamin B6 is also excreted in the feces. The classic clinical syndrome for vitamin B6 deficiency is a seborrhoeic dermatitis-like eruption, atrophic glossitis with ulceration, angular cheilitis, conjunctivitis, intertrigo, and neurologic symptoms of somnolence, confusion, and neuropathy (due to impaired sphingosin synthesis) and sideroblastic anemia (due to impaired heme synthesis). Less severe cases present with metabolic lesions associated with insufficient activities of the coenzyme PLP. The most prominent of the lesions is due to impaired tryptophan-niacin conversion. This can be detected based on urinary excretion of xanthurenic acid after an oral tryptophan load. Vitamin B6 deficiency can also result in impaired transsulfuration of methionine to cysteine. The PLP-dependent transaminases and glycogen phosphorylase provide the vitamin with its role in gluconeogenesis, so deprivation of vitamin B6 results in impaired glucose tolerance. The assessment of vitamin B6 status is essential, as the clinical signs and symptoms in less severe cases are not specific. The three biochemical tests most widely used are the activation coefficient for the erythrocyte enzyme aspartate aminotransferase, plasma PLP concentrations, and the urinary excretion of vitamin B6 degradation products, specifically urinary PA. Of these, plasma PLP is probably the best single measure, because it reflects tissue stores. Plasma PLP less than 10nmol/l is indicative of vitamin B6 deficiency. A PLP concentration greater than 20nmol/l has been chosen as a level of adequacy for establishing Estimated Average Requirements and Recommended Daily Allowances in the USA. Urinary PA is also an indicator of vitamin B6 deficiency; levels of less than 3.0 mmol/day is suggestive of vitamin B6 deficiency. The classic syndrome for vitamin B6 deficiency is rare, even in developing countries. A handful of cases were seen between 1952 and 1953, particularly in the United States, and occurred in a small percentage of infants who were fed a formula lacking in pyridoxine. Treatment of vitamin B6 deficiency lies with replacement, usually in the form of pyridoxine hydrochloride, orally, as a nasal spray, or for injection when in its solution form. Adverse effects have been documented from vitamin B6 supplements, but never from food sources. Toxicologic animal studies identify specific destruction of the dorsal root ganglia which is documented in human cases of overdose of pyridoxine. Although it is a water-soluble vitamin and is excreted in the urine, doses of pyridoxine in excess of the RDI over long periods of time result in painful and ultimately irreversible neurological problems. The primary symptoms are pain and numbness of the extremities. In severe cases, motor neuropathy may occur with "slowing of motor conduction velocities, prolonged F wave latencies, and prolonged sensory latencies in both lower extremities", causing difficulty in walking. Sensory neuropathy typically develops at doses of pyridoxine in excess of 1,000 mg per day, but adverse effects can occur with much less, so doses over 200 mg are not considered safe. Symptoms among women taking lower doses have been reported. Two reported cases of neuropathy with pyridoxine treatment of 24 and 40 mg/day may have been coincidental. Existing authorisations and valuations vary considerably worldwide. In 1993, the European Community Scientific Committee on Food defined intakes of 50 mg of vitamin B6 per day as harmful and established a tolerable upper intake level of 25 mg/day for adults in 2000. The Expert Group on Vitamins and Minerals of the Food Standard Agency UK (UK EVM) derived a safe upper level (SUL) of 10 mg/day for a 60-kg adult in 2003. The tolerable upper limit has been set by the US FDA at 100 mg/day in 2000. The nutrient reference values in Australia and New Zealand recommend an upper limit of 50 mg a day in adults. "The same figure was set for pregnancy and lactation as there is no evidence of teratogenicity at this level. The UL was set based on metabolic body size and growth considerations for all other ages and life stages except infancy. It was not possible to set a UL for infants, so intake is recommended in the form of food, milk or formula." "The ULs were set using results of studies involving long-term oral administration of pyridoxine at doses of less than 1g/day (Berger & Schaumburg 1984, Bernstein & Lobitz 1988, Dalton 1985, Dalton & Dalton 1987, Del Tredici et al 1985, FNB:IOM 1998, Parry & Bredesen 1985). A NOAEL (No-observed-adverse-effect level) of 200 mg/day was identified from the studies of Bernstein & Lobitz (1988) and Del Tredici et al (1985). These studies involved subjects who had generally been on the supplements for five to six months or less. The study of Dalton and Dalton (1987), however, suggested the symptoms might take substantially longer than this to appear. In this latter retrospective survey, subjects who reported symptoms had been on supplements for 2.9 years, on average. Those reporting no symptoms had taken supplements for 1.9 years." Because no placebo-controlled studies show therapeutic benefits of high doses of pyridoxine, and the well-documented occurrence of significant toxic effects, little reason exists to exceed the RDI using supplements unless under medical supervision e.g. in treatment of primary hyperoxaluria. Vitamin B6 has been used to treat nausea and vomiting in early pregnancy for decades, commonly in conjunction with other medications such as metoclopramide or doxylamine. Alone, it has been found safe and effective, though any woman's prenatal caregiver must help guide treatment for these symptoms. At least one preliminary study has found this vitamin may increase dream vividness or the ability to recall dreams. This effect is possibly due to the role this vitamin plays in the conversion of tryptophan to serotonin. Anecdotal evidence suggests supplemental vitamin B6 may be associated with lucid dreaming. The intake of vitamin B6, from either diet or supplements, could cut the risk of Parkinson's disease in smokers by half, according to a prospective study from the Netherlands. Nutritional supplementation with high dose vitamin B6 and magnesium is one of the most popular alternative medicine choices for autism, but randomised control trials have had mixed results and small sample sizes mean no conclusions can be drawn as to the efficacy of this treatment. Some studies suggest the vitamin B6-magnesium combination can also help attention deficit disorder, citing improvements in hyperactivity, hyperemotivity/aggressiveness, and improved school attention. Vitamin B6 has been shown in at least two small-scale clinical studies to have a beneficial effect on the carpal tunnel syndrome, particularly in cases where no trauma or overuse etiology is known. Pyridoxine may help balance hormonal changes in women and aid the immune system. The effectiveness as treatment for PMS, PMDD, and clinical depression is debatable. Ingestion of vitamin B6 possibly can alleviate some of the many symptoms of an alcoholic hangover and morning sickness from pregnancy. This might result from its mild diuretic effect. Though the mechanism is not known, results show pyridoxamine has therapeutic effects in clinical trials for diabetic nephropathy. Vitamin B6 intake and PLP levels are inversely related to the risk of colon cancer. While the correlation with B6 intake is moderate, it was quite dramatic with PLP levels, where the risk of colon cancer was decreased by nearly half. Vitamin B6 is also known to increase the metabolism of Parkinson's medications, such as levodopa, and should be used cautiously. Pyridoxine-dependent epilepsy is an extremely rare genetic disorder characterized by intractable seizures in the prenatal and neonatal period that can be treated with pharmacological doses of vitamin B6. 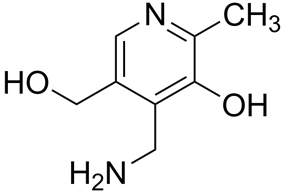 Pyridoxine is given to patients taking isoniazid (INH) to combat the toxic side effects of the drug. In one form of homocystinuria, activity of the deficient enzyme can be enhanced by the administration of large doses of pyridoxine (100–1000 mg/day). In 1934, the Hungarian physician  In 1938, Samuel Lepkovsky isolated vitamin B6 from rice bran. Harris and Folkers in 1939 determined the structure of pyridoxine, and, in 1945, Snell was able to show the two forms of vitamin B6, pyridoxal and pyridoxamine. Vitamin B6 was named pyridoxine to indicate its structural homology to pyridine. ^ Johannson S, Lindstedt S, Tiselius H (1973). "Metabolic interconversions of different forms of Vitamin B(6)" (PDF). J Biol Chem 249 (1): 6040–6046. ^ Ink SL, Henderson LM; Henderson (1984). "Vitamin B6 metabolism". Annu. Rev. Nutr. 4 (1): 455–70. ^ Lichtstein HC, Gunsalus IC, Umbreit WW; Gunsalus; Umbreit (1945). "Function of the vitamin B6 group; pyridoxal phosphate (codecarboxylase) in transamination" (PDF). J Biol Chem. 161 (1): 311–20. ^ Food and Nutrition Board. Institute of Medicine (2001). ""Dietary Reference Intakes: Vitamins"". ^ Gibson R.S. (2005). "Assessment of vitamin B6 status.". Principles of Nutritional Assessment (2nd ed.). New York: Oxford University Press. pp. 575–594. ^ a b Liu A.,Lumeng L., Aronoff G., Li T-K.; Lumeng; Aronoff; Li (1985). "Relationship between body store of vitamin B6 and plasma pyridoxal-P clearance: metabolic balance studies in humans". Journal of Laboratory and Clinical Medicine 106 (5): 491–497. ^ Food and Nutrition Board Institute of Medicine (1998). Dietary Reference Intakes for Thiamin, Riboflavin, Niacin, Vitamin B6, Folate, Vitamin B12, Pantothenic Acid, Biotin, and Choline. Washington, D.C.: National Academy Press. ^ Leklem J (1990). "Vitamin B-6: A status report". J. Nutr 120: 1503–1507. ^ Menkes, John H (1980). Textbook of Child Neurology. Henry Kimpton Publishers. ^ Massé, PG; Boudreau, J; Tranchant, CC; Ouellette, R; Ericson, KL (2012). "Type 1 diabetes impairs vitamin B(6) metabolism at an early stage of women's adulthood". Applied physiology, nutrition, and metabolism = Physiologie appliquee, nutrition et metabolisme 37 (1): 167–75. ^ Ulvik A, Midttun O, Pedersen ER, Eussen SJ, Nygard O, Ueland PM; Midttun; Pedersen; Eussen; Nygård; Ueland (2014). "Evidence for increased catabolism of vitamin B-6 during systemic inflammation". Am J Clin Nutr 100 (1): 250–255. ^ Rall L.C., Meydani S.N. ; Meydani (1993). "Vitamin B6 and immune competence". Nutrition Reviews 51 (8): 217–225. ^ Bhagavan H.N. (1985). "Interraction between vitamin B6 and drugs". In Reynolds R.D., Leklem J.E. Vitamin B6: Its role in Health and Disease. New York: Liss. pp. 401–415. ^ Wilson SM1, Bivins BN, Russell KA, Bailey LB; Bivins; Russell; Bailey (2014). "Oral contraceptive use: impact on folate, vitamin B6, and vitamin B12 status". Nutr Rev 69 (10): 572–83. ^ Schwaninger M1, Ringleb P, Winter R, Kohl B, Fiehn W, Rieser PA, Walter-Sack I; Ringleb; Winter; Kohl; Fiehn; Rieser; Walter-Sack (1999). "Elevated plasma concentrations of homocysteine in antiepileptic drug treatment". Epilepsia 40 (3): 345–50. ^ Corken M1, Porter J; Porter (2011). "Is vitamin B(6) deficiency an under-recognized risk in patients receiving hemodialysis? A systematic review: 2000-2010". Nephrology (Carlton) 16 (7): 619–25. ^ Perry TA, Weerasuriya A, Mouton PR, Holloway HW, Greig NH; Weerasuriya; Mouton; Holloway; Greig (2004). "Pyridoxine-induced toxicity in rats: a stereological quantification of the sensory neuropathy". Exp Neurol2004 190 (1): 133–144. ^ Schaumburg H, Kaplan J, Windebank A, Vick N, Rasmus S, Pleasure D, Brown MJ. Sensory neuropathy from pyridoxine abuse. A new megavitamin syndrome. N Engl J Med 1983, 309, 445–448. ^ Foca FJ (September 1985). "Motor and sensory neuropathy secondary to excessive pyridoxine ingestion". Arch Phys Med Rehabil. 66 (9): 634–6. ^ a b Katan MB (Nov 12, 2005). "[How much vitamin B6 is toxic?]". Ned Tijdschr Geneeskd. 149 (46): 2545–6. ^ Sheehan P. Hyperemesis gravidarum--assessment and management. Aust Fam Physician. 2007 Sep;36(9):698–701. ^ a b Ebben, M.; A Lequerica; A Spielman (2002). "Effects of Pyridoxine on Dreaming: a Preliminary Study". ^ "Increased intake of vitamin B6Sheet". Retrieved 2006-08-11. ^ Pfeiffer SI, Norton J, Nelson L, Shott S; Norton; Nelson; Shott (October 1995). "Efficacy of vitamin B6 and magnesium in the treatment of autism: a methodology review and summary of outcomes". ^ Angley M, Semple S, Hewton C, Paterson F, McKinnon R; Semple; Hewton; Paterson; McKinnon (2007). "Children and autism—part 2—management with complementary medicines and dietary interventions" (PDF). Aust Fam Physician 36 (10): 827–30. ^ Mousain-Bosc M (2006). "Improvement of neurobehavioral disorders in children supplemented with magnesium-vitamin B6. I. Attention deficit hyperactivity disorders". Magnesium Research 19 (1): 46–52. ^ Ellis J, Folkers K, Watanabe T, Kaji M, Saji S, Caldwell JW, Temple CA, Wood FS (Oct 1979). "Clinical results of a cross-over treatment with pyridoxine and placebo of the carpal tunnel syndrome". Am J Clin Nutr 32 (10): 2040–6. ^ Kasdan ML, Janes C.: Carpal tunnel syndrome and vitamin B6. Plast Reconstr Surg. 1987 Mar;79(3):456–62. ^ Kashanian, M.; Mazinani, R.; Jalalmanesh, S. (2007). "Pyridoxine (vitamin B6) therapy for premenstrual syndrome". International Journal of Gynecology & Obstetrics 96 (1): 43–4. ^ Ebbets, Russ. "The Mysterious Vitamin B6". ^ Sergi V.C., Wenhui Zhang, Billy G.H., Anthony S.S., Paul A.V. Pyridoxamine protects proteins from functional damage by 3-Deoxyglucosone; mechanism of action of pyridoxamine. Biochemistry 2008, 47, 997–1006. ^ Larsson SC, Orsini N, Wolk A; Orsini; Wolk (March 2010). "Vitamin B6 and risk of colorectal cancer: a meta-analysis of prospective studies". JAMA 303 (11): 1077–83. ^ 2 and the pellagra-like dermatitis in rats," Nature, vol. 133, pages 498–499. ^ György P, Eckardt RE; Eckardt (September 1940). "Further investigations on vitamin B(6) and related factors of the vitamin B(2) complex in rats. Parts I and II". Biochem J. 34 (8–9): 1143–54.